"Serve over cooked rice. Red potatoes are a good side dish. You need to marinate the breasts for about 4 to 6 hours in the refrigerator first." Heat 1 tablespoon of olive oil in a medium saucepan over medium heat. Add garlic and saute for 5 minutes. Remove from heat and stir the garlic mixture into the red wine vinegar. Place the goose breasts into a shallow glass dish and cover with the vinegar mixture. Cover and refrigerate for at least 4 hours. In a medium saucepan over medium heat, combine the milk, onion and carrot. Gradually bring to a boil, stirring frequently. Season with pepper to taste. As soon as the mixture comes to a boil, remove from heat, cover and set aside. Preheat oven to 350 degrees F (175 degrees C). 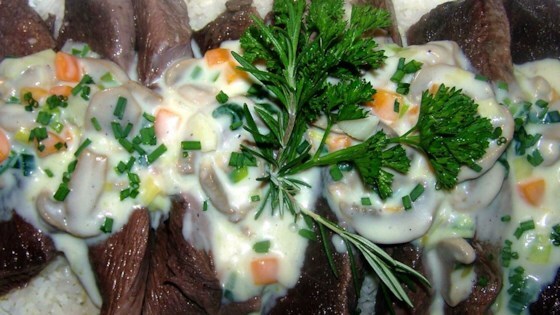 Place goose breasts and marinade into a baking dish and cover with foil. Roast for 25 to 30 minutes in the preheated oven. Cook white rice according to package directions. Heat two tablespoons of oil in a small saucepan over medium-low heat. Add mushrooms and saute for 5 minutes. Whisk in the flour, stirring for 2 minutes, then gradually whisk in the milk mixture. Season with rosemary, salt and pepper. Bring to a boil, stirring constantly, then reduce heat to low and simmer for 3 minutes. Make a bed of cooked white rice on a serving platter. Lay the goose breasts on top and pour the sauce over all. See the easy way to make gorgeous roast goose for Christmas dinner! My family really liked this recipe. I added 1/2 cup of sugar to help tone down the vinegar taste. The vinegar was too overpowering, but the sauce was tasty.